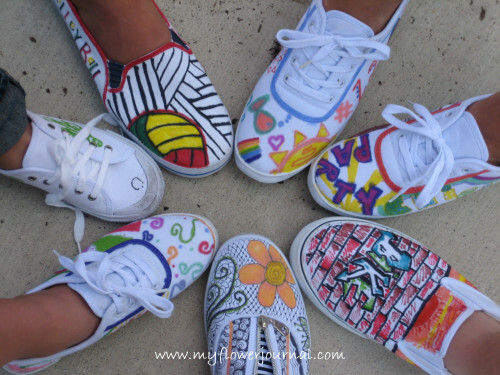 Painted shoes are a summer craft that’s fun for all ages. This is what you need: your favorite kids, a pair of white canvas shoes, black extra fine tip sharpie makers and regular sharpie markers in lots and lots of colors. If you want to go the extra mile have some music playing and plenty of otter pops and ice cream. Since I wanted flowers to be the focal point on my shoes I drew those on first with an extra fine black sharpie. You could use a pencil first then go over it with the sharpie. Then I started to add my background designs zentangle style. 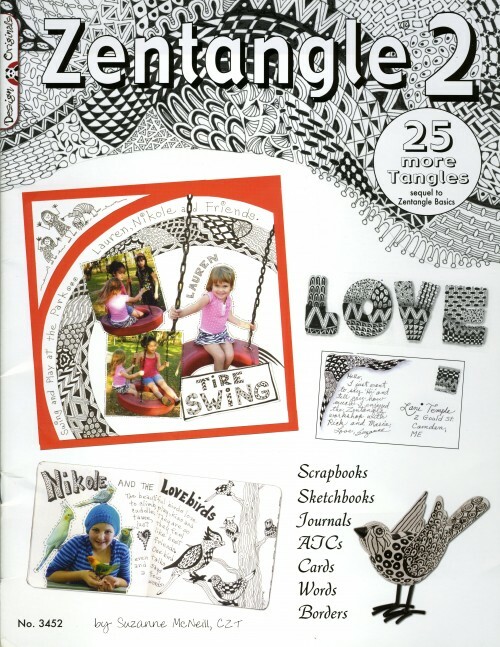 You can learn all about zentangle and find lots of design ideas on the internet. 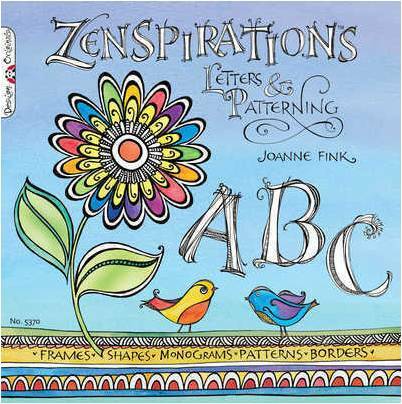 I really like these two books: Zenspirations and Zentangle 2. The first one even has some fun flower designs. This project can take a while. If your slow like me you may not have time to fill both shoes with designs so start at the front and work back. Do a little on each shoe instead of trying to finish one shoe before you start on the second one. After your happy with your design you can add all the color you want! Look at what some of my favorite kids created! 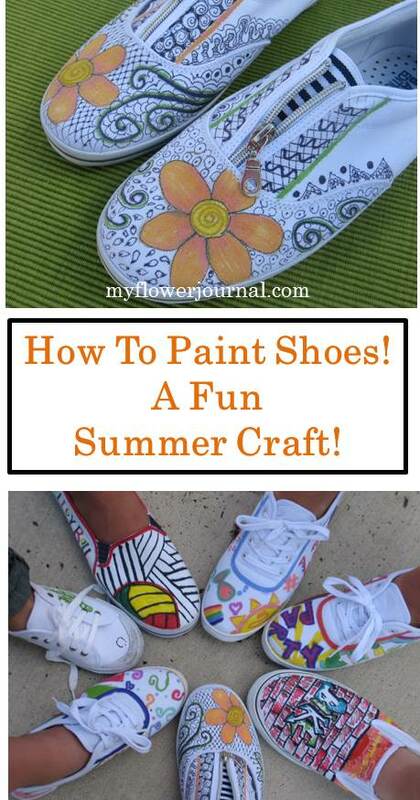 Hope you put painted shoes on your list of summer crafts to do! Thanks for the invite. I’ll do it! Hi! Nice to meet you! These shoes are amazing, thank you so much for sharing them! Please stop by and share on our Brag About It Tuesday Party. You’ve been FEATURED on the BeBetsy BRAG ABOUT IT No. 11. http://bebetsy.com CONGRATS TO YOU! Grab a featured button here http://bit.ly/11S2wN1 then tell all your friends and family – they will be impressed! Our next party starts at midnight tonight so find something cool to BRAG ABOUT and link it up. These shoes are just so adorable…what a fantastic project!!! These shoes are absolutely AWESOME !! So adorable Tammy, what a cute idea! 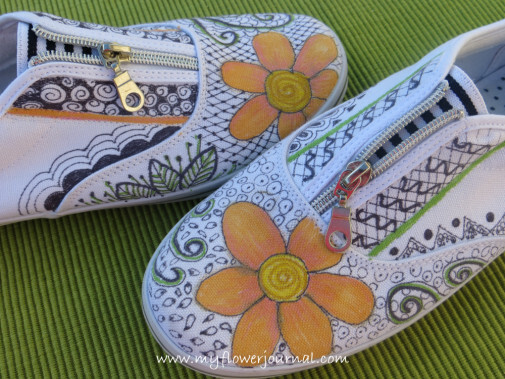 I used to paint little flowers on my daughter’s baby shoes, now I am going to have to try something like this! How much fun! And those are some pretty talented kids you’ve got there. Thanks for sharing at Inspire Us Thursday. So cute! When my kids were younger we painted many a t-shirt…such fun! Adorable!! =) I love the big orange flower!